Thursday, Nov. 8, 9:30 a.m.-4:30 p.m.
Congratulations to almost alumni Jasmine Thomas who was asked by the SALO Director, Mr. Melvin Thompson, to speak in front of the Polk State College Board of Trustees and College President, Dr. Falconetti on November 26, 2018. 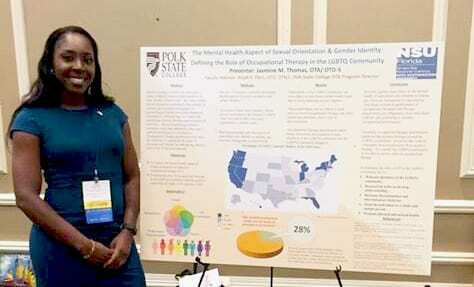 Jasmine was asked to discuss her recent Honorable Mention for Scientific Rigor for her topic OT’s Role in Mental Health for the LGBTQ Community. She was recognized among all OTA programs who participated at the recent FOTA conference in October 2018. We applaud Jasmine for her success thus far and wish her nothing but the best as she continues her Doctoral studies in Occupational Therapy. This Eagle continues to strive for excellence and we couldn’t be more proud! Special acknowledgment to Student Services, namely SALO and SGA for the support and funding of the OTA Club by sending our students to FOTA conference each year! Meet Jasmine Thomas, recent 2018 alumni and Class President of the OTA program and currently enrolled as a Doctoral OT candidate at Nova Tampa. She is also a single mother and substitute Biology teacher and fitness instructor who survived the OTA program with a smile on her face each day. She represented Polk at the annual FOTA conference in Orlando FL in the OTA category. Her topic was ‘The Mental Health Aspect of Sexual Orientation and Gender Identity- Defining the Role of Occupational Therapy in the LGBTQ Community’ Historically. It is rare for OTA projects to be recognized for scientific rigor, it’s usually the MOT or OTD programs. 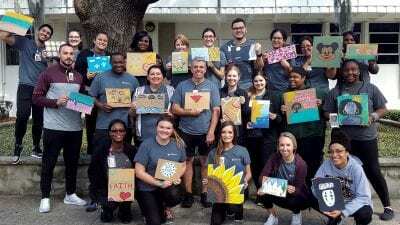 This proves that OTA students can indeed achieve greatness at the AS level and continue to promote leadership at Polk State College despite their fears.